Regulating Rees Harp Levers — Rees Harps Inc.
How to regulate Rees sharping levers. When your new Rees lever harp first arrives the levers will already be properly regulated. Levers are said to be regulated when there is a half-step up in tone between being unengaged and being engaged. If your F string is tuned to F and the lever is properly regulated then when the F lever is flipped up the tone will be a true F-sharp. If you have your B strings tuned down to B-flat then when the lever is down the note will be B-flat and when the lever is engaged the note will be B. In both cases, this is an example of a half-step. 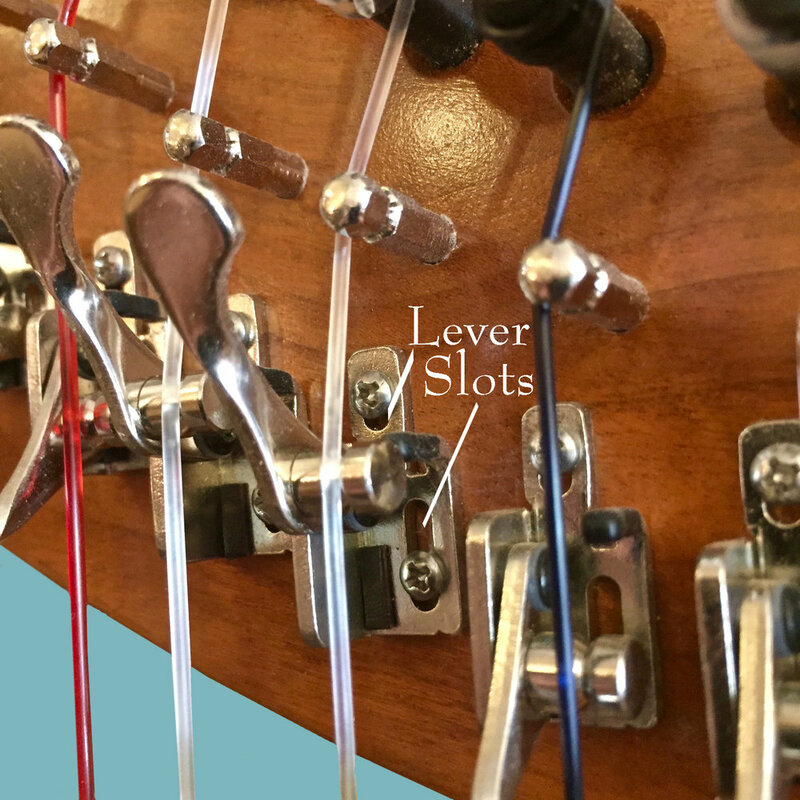 Over time and due to the natural processes of aging, lever harps can come out of regulation, meaning that when the levers are engaged they no longer give a true half-step. Fortunately, all well made lever harps can be put back into regulation. Minor regulation adjustments can be done by harp owners (though we are more than happy to do them as well.) Should a harp require major regulation it can be done by the owner but we recommend that it be done by a harp lutherie or at a harp shop which offers repair servicing. When a sharping lever is engaged on a properly regulated lever, the lever fret (see Diagram 1) pushes against the string shortening the vibrating length of the string while also slightly stretching the string thereby raising the pitch a half-step. A half-step is achieved if the lever is pressing the string at the proper location and the bridge, which guides the string through the lever, is at the correct height to stretch the string and produce enough pressure on the lever fret to render a clear voice. When doing minor lever regulation there are two ways to alter the pitch of the note: raising or lowering the bridge or adjusting the lever itself utilizing the slots on the lever. For a major regulation the lever must be removed and reset on the arch requiring, among many other things, the drilling of new holes for the screws. Even if you are only doing minor regulation the biggest thing to keep in mind is that a little goes a very long way. Whatever adjustments you make, be very conservative. You can recover from an over adjustment but it will take more time and is really frustrating. If, instead, you make the smallest adjustment possible and then make another if needed will, in the end, take less time. Diagram 2 - For Rees levers adjusting the bridge in, toward the arch, raises the pitch. Turn clockwise to lower the bridge. Digram 3 - For Rees levers adjusting the bridge out, away from the arch, lowers the pitch. Turn counterclockwise to lower the bridge. At Rees Harps we use threaded bridge pins. Because we use threaded bridges making minor regulation adjustments with the bridge is really pretty simple. Rees levers push and stretch the string away from the neck so lowering the bridge in, toward the neck, will raise the pitch (Diagram 2) and raising the bridge, away from the neck, will stretch the string less and lower the note (Diagram 3). If you have our newer threaded bridges you will need a 4mm hex nut driver to make adjustments correctly. These may be purchased through the Rees Marketplace as part of the Rees Lever Regulation Kit. Use your chromatic tuner to determine the correct pitch. it is important, when adjusting the bridge, that the string have enough clearance so that it will not buzz against the lever when played. Check this by repeatedly playing the string, with and without the lever engaged. Be sure to sit behind the harp and play in your normal position since pulling a string at an incorrect angle can cause a buzz even if the lever is adjusted perfectly. Another consideration is that the string must have enough pressure on the lever fret to give a clear voice. If the voice is fuzzy or thumpy you need to put more stretch, more pressure on the lever fret. On a Rees lever do this by lowering the bridge just a bit. If you accidentally go too far and the action of the lever pops the string out of the groove of the bridge then go ahead and restring that string so that it winds on the tuning pin in such a way that it feeds into the groove of the bridge at a straighter angle. Older style bridges are set into the neck with a tight, friction fit. To adjust these bridges you simply tap them in or pull them out based upon which kind of lever you have. Tap in to raise the pitch for Rees levers. Use a little piece of wood between the bridge and the hammer when tapping the bridge for a little more control. To pull a bridge out use pliers with the jaws wrapped in masking tape, to protect the finish and smoothness of the bridge. Be careful not to break the string with the pliers. Diagram 4 - For Rees levers the lever screws require a #1 Phillips screwdriver. Diagram 5 - For Rees levers move them up on the slots to lower the pitch and down on the slots to raise the pitch. In order to correct larger regulation inaccuracies, the lever may have to be moved. This is usually done by sliding the lever either up or down in the lever slots. (See Diagram 4) It is important that you use the right size of screwdriver when making an adjustment on your levers. Using the wrong tool can damage the slots or corners of the bridge and effectively strip the screw. For Rees levers you will need a #1 Phillips screwdriver. They are available as part of our Rees Lever Regulation Kit in the Rees Marketplace. Once you have the proper screwdriver loosen (but do not remove) the screws holding the lever down so the lever can slide in the lever slots. Move the lever towards the bridge pin to lower the pitch, by creating a longer vibrating string length, or away from the bridge, which raises the pitch by creating a shorter vibrating length (See Diagram 5). Pinpoint the correct location with your chromatic tuner and tighten down the screws. You may find that it helps to have a little piece of masking tape standing by to place underneath the lower edge of the lever once you have located the sweet spot. This will help to mark the placement until you have a chance to get the lever firmly screwed down into the new location. As stated above, we recommend that if levers must be completely taken off and physically moved in order to regulate your harp, this work should be done by a luthier. If you would like to have the instructions on how to put a Rees lever on your harp you may download our pdf on the subject.